On the art of reality television? It’s probably a good thing I don’t have cable. I would watch an embarrassing amount of embarrassing television. I can get ridiculously sucked in to House Hunters, and it only fuels my tendencies toward misanthropy. The couples almost never choose the most obvious, rational, smartest choice. And yes, occasionally there are singletons on those shows, but let’s face it, they make me much less angry than the couples. In fact, one afternoon, while in Alabama (road trip day five, for those keeping track), I spent the entire afternoon hanging on the couch watching House Hunters. The first episode I watched featured a couple with a $400,000 budget in St. Louis and they could not be satisfied. Two of the three houses they refused to see all of because of end-all deal breakers two rooms in. I hated the wife. Okay hate is a strong word. I don’t know her. But she was stupid. The second episode was the quirky hipster pixie in Seattle who wanted a fixer-upper. She bought a true fixer upper. The first two tasks were to 1) get rid of the rats, and 2) add a ceiling to a couple of rooms of the house. I loved her, and was pretty sure she’s related to the Bloggess – she had a taxidermied squirrel for heaven’s sake! I’ve also been keeping up with the Kardashians (see what I did there?) in their infinite rerun schedule, and, while I’m not proud of it, I will at least admit that I watch and am completely fascinated by the Jenner-Kardashian situation. I cannot quite put my finger on why I find myself captivated by this show, but couldn’t sit through a Real Housewives episode or that new Eastwood show. Okay, I did watch a couple episodes of Mrs. Eastwood, but that’s all I could take. I was thinking about it while driving through a bit of Atlanta (road trip days 10-11), and I’ve decided that I am drawn into the Kardashians’ world because of their authenticity. Yes, on one level, I tune in for shallow reasons; they are beautiful people spending lots of money and saying silly things. Clearly, the train-wreck factor is at work here. It’s hard to look away. But the more I watch, the more I get the sense that the people I watch on this show are the people they are, through and through. At the end of the previous season, when we all knew Kim & Kris Humphries’ extremely short fairytale wedding had come to an end, but we watched her slowly realize the inevitable, I got the profound sense that she wasn’t duping us. Her own celebrity had duped her. She thought love is as real as the diamond is big and sparkly, and commitment as eternal as her ball gown is extravagant. She really thought that was love. And when she started to accept the reality, she was heartbroken. This is not how life is supposed to work itself out. Most people will probably judge me for what I’m about to say, but here it is: I felt bad for Kim Kardashian, and identified with her. We could not be more different, but when I watched her I resonated with her painful acceptance of a life gone not according to plan, and the heartbreak of reassessing where she was at age 30, and reconciling that with where she thought she’d be. Same with how these people work out their expectations in other areas of their lives, and in other relationships. Yes, I get it. I know that the Kardashians are ridiculous. I know that it is silly to pay attention to famous people who haven’t earned their fame. (What does that even mean, anyway?) And I know that reality television is a dangerous drug. But I watch it, I’m fascinated by it, and that is why. To sugarcoat it, we are, in fact, in this thing called life together, right? And famous, beautiful, ridiculously wealthy people are humans too. Oh God, now this post has devolved into some pathetic defense of a t.v. show I mostly love to hate. Hate to love. Something. I switched over from E! 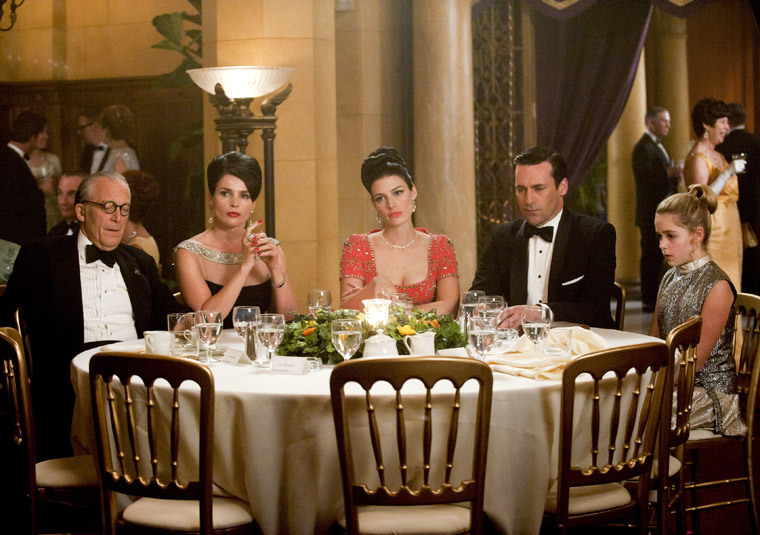 the last couple of days to (finally) get caught up with Mad Men, the drama for the intellectual, jet-setting type. Right. As I was watching the middle episodes from the current season, I was struck by distinct parallels between cultural obsessions with families like the Kardashians and casts of characters from the likes of Mad Men. I’m not sure if there is a single character on Mad Men that I genuinely like. (Right now, maybe Joan, but I have my doubts about her as well.) On the whole, these are not good or nice people. They sleep around, they drink constantly, and by most accounts, lead fairly empty lives. And yet I cannot stop watching. Is this fixation the same? Is it the train-wreck effect only with a fictional story? Is the fact that it is fiction make it somehow more excusable, even acceptable, to observe these people be mostly terrible people to themselves and each other? Is the fact that it’s fiction not “reality” television automatically validate it as “art”? Does any of that matter? Do we need philosophical reasons to legitimize what we choose to watch or DVR? I don’t know. I really don’t. So, here I am. I love the Kardashians. I love Mad Men. I love House Hunters. But please don’t make me watch Glee.